Quilts featured in this Gallery have been made by quilters who are SAQG members from South Africa and beyond our borders. Quilters are selected at random and invited to submit 3 quilts/items to be displayed in the Gallery and admired by Viewers. There will be a rotation of more quilt art by other SAQG quilters, so watch this space and enjoy! Quilt was inspired by a pattern of Pamela J Curo for Cotton Tales – just had to make it in another colourway!! Combination of cotton pieced blocks with wool felt applique. 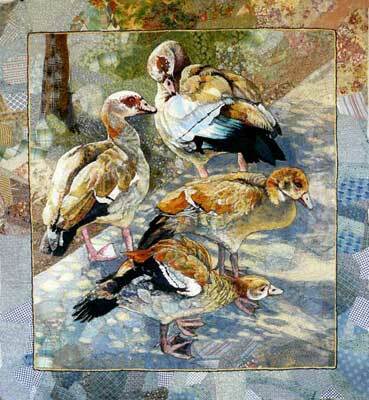 Quilted by Stephanie Geldenhuys. by Beverley Rebelo, Harare, Zimbabwe. Passacaglia design by Willyne Hammerstein. by Beverley Rebelo, Harare, Zimbabwe. Original design. by Sue Prins, original design by Sue. 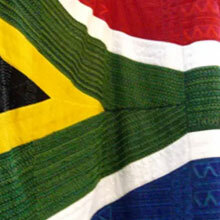 Won First Place of Country, South Africa, at World Quilt Competition, 2007.
by Sue Prins, original design by Sue depicting the various quilting groups she’s been a part of. Won Challenge competition at Fynbos 2010.
by Sue Prins, original design by Sue. Won Third Place in Traditional category, World Quilt Competition 2013. Designed and made by Sandra de Wet. Johannesburg 2015. 45 x 30cm. Inspired by a clay pot with flowering cactus on my patio. The cactus plant is 3D and a wide variety of fabrics convey the textures of the pot and paving. Designed and made by Sandra de Wet. Johannesburg 2018. 30 x 21cm. Butterfly and background merge in the shredded fabric of the chenille technique used, offset by the complementary colours. by Helga Beaumont, Kloof, Natal. In traditional Zulu Culture the Isangoma (Diviner), the Inyanga (Herbalist) and the Abathakathi (Evil one) still exist and they inter relate with each other as represented by the three shapes on this quilt. by Helga Beaumont, Kloof, Natal. My garden in Kloof was the inspiration for this quilt. by Helga Beaumont, Kloof, Natal. This chicken was created at the time of Nkandla. by Sue Cameron, Kwa-Zulu Natal. This quilt was made in memory of Kathy Grant, who had intended to make a Dear Jane Quilt. It was made using techniques she loved, pieces of her fabric and altered Dear Jane blocks. by Sue Cameron, Kwa-Zulu Natal. The number seven and circles are important elements in this quilt. They symbolise the wholeness achieved through family. The family tree completes the imagery. by Sue Cameron, Kwa-Zulu Natal. What would happen if roles were reversed and the mielie started eating the chickens? The mielie is based on an evil "Bond Girl" who is terrorizing the chickens! Inner City Charm - was started in our Charm Club swap. by Grace Nobili. Members of the club exchanged fabrics for a year and in the meantime worked on our different projects. All the piecing is by machine something I had previously only tackled by hand. The greatest challenge was to find enough light fabrics. by Grace Nobili. The 365 small block challenge was launched on the internet and I was keen to participate making a couple blocks a week. I had always wanted to make the Kitty Stairway and thought I would kill 2 birds with one stone and combined the two. by Grace Nobili. For many years this one was on my Bucket List. The blue and orange colours talked to me and this was the result. The Quilting in feathers just completed the picture This is by far my most favorite quilt. Name of quilt-maker: Louise Combrink Quilter: Louise Combrink Region: Stellenbosch, Western Cape. designed by Maretha Fourie and made by Maretha, Christine Moolman (owner) Elsa Vermaak and Irene van Tonder, quilted by Petro van Rooyen. 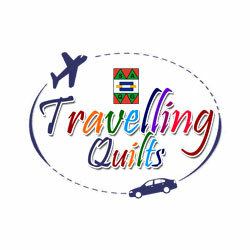 Gauteng from Golden Rand Guild for Quilters. Made and machine quilted by Dal Botha, Western Cape. Inspired by Gustav Klimt’s Water Serpents II. Made and machine quilted by Dal Botha, Western Cape. Inspired by the rivers of fire running down the mountain behind my house during the 2017 fire in Pringle Bay. Designed, pieced and quilted by Jenny Smith. Designed and pieced by Jenny Smith. Quilted by Mandy Mahr. Design inspired by Red Pepper Quilts. Designed, pieced and quilted by Jenny Smith. A memory quilt to express the sad finality when my mother died. In her hand a faded note “For my children”. The typewriter expresses the feeling of the final journey. A reminder of my everlasting love for her, until we meet again. original design by Claire Wallace in 2018 for the World Quilt Competition. Wholecloth quilt made on silk, wool and cotton blend batting, Glide and Glisten thread. Quilted on HandiQuilter Simply Sixteen machine. 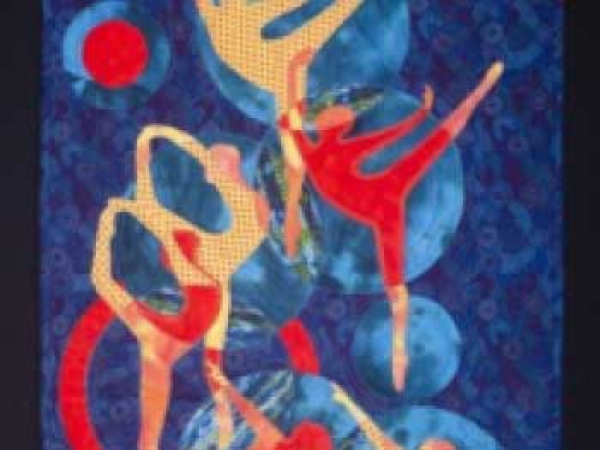 Original design by Claire Wallace in 2015 for National Quilt Festival in Natal. Shweshwe hexagons hand pieced, machine quilted in HandiQuilter Fusion 24. Original design by Claire Wallace in 2015 for National Quilt Festival in Natal. Radiance cotton sateen fabric wholecloth. Wool and cotton blend batting. Silk thread. by Paul Schutte, Golden West Guild. The sun shines on everything on earth. It provides light and makes life possible. Human vision, however, is limited and we always see through frames, while nature itself transcends all boundaries. by Paul Schutte, Golden West Guild. I experienced the devastation of a veld fire and the damage to nature and especially trees. On a macro level I am also concerned about the condition of the earth. Are we busy to ‘burn down’ our earthly Paradise? Cotton and cotton blends; machine pieced and machine raw edge appliqued; machine quilted. Part of my tree-series. A lonely tree with a possible “ghost image”. by Hazelmay Duncan, Cape_Town, GHQG. Made as a teaching sample for my class at the 2004 Durban ‘Celebrations’ Festival. Log Cabin is a favourite quilt pattern of mine. by Hazelmay Duncan, Cape Town, GHQG. I love using picture prints to personalise a quilt. Every piece in this one has a particular memory or significance to ME - special people, places, events and things are all there. by Hazelmay Duncan, Cape Town, GHQG. 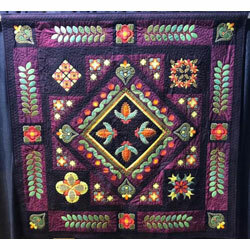 Made in the year that I was 66, but extended to 70 blocks - which gave me a better layout and extra time to do the hand-quilting which I so enjoy. by Jenny Hermans, Cape Town, 2010 – featured in Images of Sport exhibition.